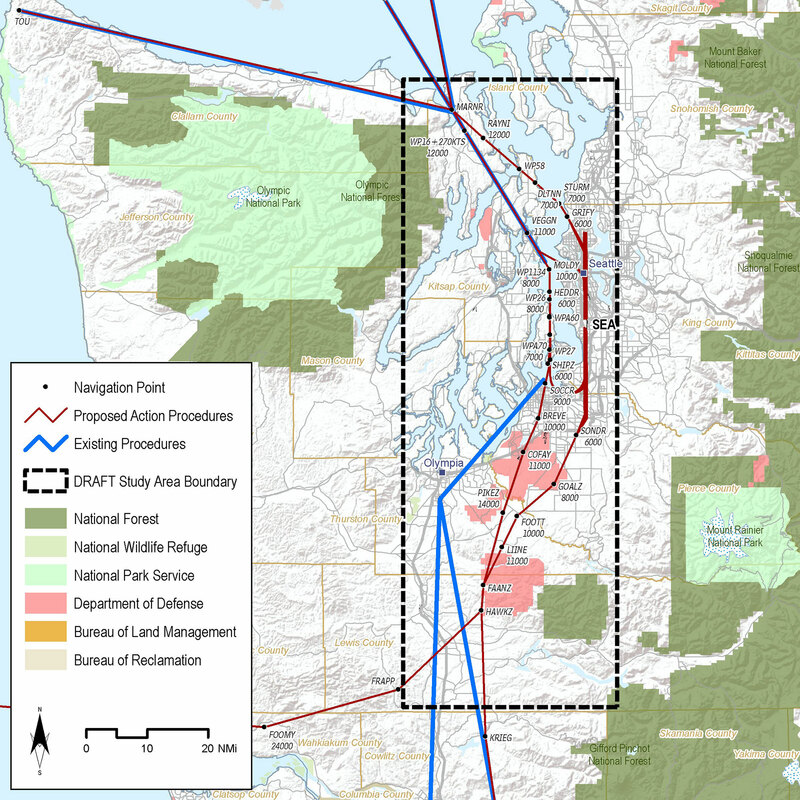 HMMH was the prime consultant on the FAA’s NextGen Environmental Support Services Contract, and was tasked with evaluating airspace and procedural design proposals in an Environmental Assessment (EA) for Seattle–Tacoma International Airport. The EA addressed two new Standard Terminal Arrivals (STARS) from the northwest and southwest, 21 Required Navigational Performance (RNP) procedures and Optimized Profile Descents to each of the six runway ends. HMMH prepared and delivered a Draft and Final EA in less than one year, with the Finding of No Significant Impact (FONSI) and Record of Decision signed by the FAA on November 1, 2012. Benefits of the new arrival procedures into SEA included a reduction in level-off segments, more direct routings to the runways, increased flight path predictability and flexibility with improved precision during Instrument Meteorological Conditions, reduced long downwind legs, and decreased communication requirements between pilots and controllers. Technical analyses primarily addressed environmental effects on noise, emission levels, air quality, and fuel burn.